Don't overlook your front end when rebuilding your classic Chevy car. 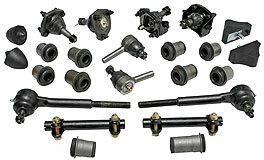 Replace your old worn out bushings, ball joints and tie rod ends. CPP's rubber front end kits make it possible to achieve better than new performance for a modest price. Both kits include upper and lower ball joints, outer tie rod ends, control arm bushings and bump stops. Sway bar bushings sold separately. The complete kit also includes inner tie rod ends, tie rod adjusting sleeves, and idler arm bushings. Note: #5557SFKR will not work for original power assist.